We have adapted our 18×7 stainless steel rope to create a non-rotating equivalent which will come in handy for a variety of lifting applications. This 6mm 18×7 Non-Rotating Stainless Steel Wire Rope example is the narrowest we offer and it can be supplied along with the fittings necessary to make it immediately useful. Rope Services Direct can provide you with various types of non-rotating rope. In the case of this 18×7 configuration product, as with its siblings, the effect is achieved by running the inner bundles of wires in opposition to the outer layer. The reason to choose non-rotating rope is usually related to lifting operations. Moving loads which are heavy, delicate or in some other way sensitive to being spun means that a normal stainless steel rope might be a hazard. This 6mm non-rotating rope, on the other hand, will keep everything stable and provide excellent resistance to corrosion and abrasions as well. Use our contact details below to get in touch if you need in-depth information about how this wire rope will perform in practice. Its simplest stats are its working load limit and breaking force, which sit at 1,887kg and 18.5kN respectively. Larger diameter versions of this rope are offered, going right up to 16mm . Make sure to check the parameters of each product to ensure you are making an informed decision. You can call 01384 78004 to make an enquiry or get a quote. Our friendly sales team is also reachable via email. 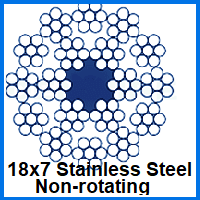 6mm 18x7 Non-Rotating Stainless Steel Wire Rope Overall rating: 5 out of 5 based on 6 reviews.